Having recently returned from our family’s June vacation to Disney World, I wanted to be sure to fill everyone in on one more detail. A little gem I came to love known as Rider Swap. I have known about the option for a while but will admit to never using it before, I was a little unsure of how exactly it worked. My family is used to going in the fall/winter when lines aren‘t all that long. Going in June was still wonderful but it took some time to get used to the crowds and heat that we’ve become so spoiled by avoiding while going during off season. Our son has been tall enough to ride most rides for a while now, something I have taken for granted. 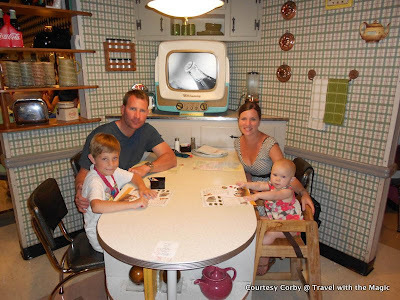 This was our first trip going to Disney World with a very mobile one year old. For those that don’t know, I have two children who are 6 years apart. So what does one do when one child can ride on nearly everything and one is still a baby? Does one parent get to ride all the rides while the other watches the youngest? How do you take turns especially when the older child prefers to ride with one parent? I’m embarrassed to admit but it wasn’t until day 4 of our vacation when out of desperation I decided to test out this wonderful option. My son wanted ride an attraction that had a height requirement yet again, so that meant someone would have to sit out with our youngest…again, and that person would be me. I quite frankly was tired of chasing my little one around in the crowds for an hour while they rode rides. I told my husband to try and use the Rider Swap option. It was time I got to bottom of this and wanted to know what it was all about. All he did was go up to a Cast Member at the entrance and said he’d like to use the Rider Swap. The Cast Member handed him a small ticket and pointed he and my son to the Fast Pass line. I was shocked when they returned in very little time! They then handed me the ticket and then it was my turn to use the Fast Pass line. Best part is you can bring 2 others with you, so my son was able to ride twice, once with each parent which he greatly enjoyed. Not every attraction offers the Rider Swap option but there are many that do. Here is a link from Disney’s website that lists the attractions, http://disneyworld.disney.go.com/attractions/. This option was truly a lifesaver for my family. If you have a child that doesn’t meet the height requirements and one that does, take advantage of this wonderful benefit! It doesn’t cost any extra and it will make your vacation all the more enjoyable for everyone in your family. Contributed by Corby C. of Atlanta, Georgia. She is a proud wife and mom to Banks and Henley, a Disney Destination Planner with Travel with the Magic and one of our Minnie Moms.